Legal Advantage LLC offers utility drawings done right: simple, clear, and accurate drawings that meet the strictest USPTO demands and define your invention with no room for error. Design patents are meant to protect the structural and ornamental appearance of a product as it appears to the eye of the layman consumer. As far as design patent applications are concerned, the drawings themselves are the claims—that is, it is the drawing’s job to visually and precisely define the extent of the novel design. Drawings must be consistent from view to view and communicate even the most subtle nuances in form or appearance. Black ink on white paper is also standard. Design patent applications need not include photographs or color drawings. If one or both are included, a petition must be filed to explain why the color drawings or photographs are necessary. 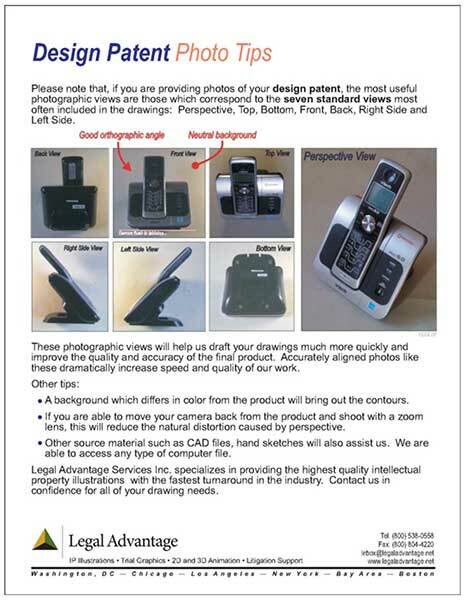 Legal Advantage LLC has worked on more than 30,000 patent illustration projects over more than a decade. Our expert team of patent illustrators follows a proven process that incorporates knowledge we have gained from years of real-world legal experience—a process built around providing surefire protection for our clients’ intellectual property. For more information on design patent drawings in Los Angeles, CA and other major locations in the US and abroad, call (301) 637-6180 or fill out our contact form to get in touch with the Legal Advantage LLC office. If you do not have access to CAD, you can help your patent illustrator produce accurate drawings by providing photos that match the seven standard views listed above. Three levels of quality control: lining, shading, and dimensions. The latest high-end CAD technologies. Fast turnarounds at an unmatched cost. Comprehensive 72-point quality checklist for quality product delivery. Specialized reports provided for more than 30 types of prior art services. Familiarity with patent illustrations, patent drafting, patent monetization, prior art searches, freedom to operate, and licensing.